When Fred Mathieu ’19 is on the track running the 200-meter sprint, he thinks about what he needs to do, how he needs to do it, and how hard he has worked for this moment. And when he hears cheering from his Regis teammates, he knows that he can keep going—that he can finish the race and finish strong. The scenario is reflective of life for the 20-year-old, who has relied on both himself and his support networks to get through tough times; the toughest was losing his mother to pancreatic cancer two years ago. Mathieu’s positive Regis experience began even before he met his supportive track teammates. When he was first exploring the school, he recalls a conversation with Admission Representative Joe Amorosino. Mathieu served as SGA freshman class representative and was later elected as communications coordinator on the SGA Executive Board. Now, as a resident assistant in Angela Hall, he helps first-year students discover their talents and recognize their ability to take those talents to the next level—similar to what Norton did for him just a year earlier. His philosophy when it comes to connecting with residents is to always enter every situation with an open mind and an open heart. Mathieu had to find his own voice at an early age as he advocated for his mother while she was in the hospital with cancer. He remembers how long it would take for nurses to answer her calls for medicine to help ease her constant pain, and how lack of movement caused her bed sores to worsen. “I feel like the nurses eventually gave up on her,” he says. “I want to make sure no one receives that kind of neglect and lack of respect, so I plan to use my Regis degree to work in a role that will enhance the caregiver-patient relationship. 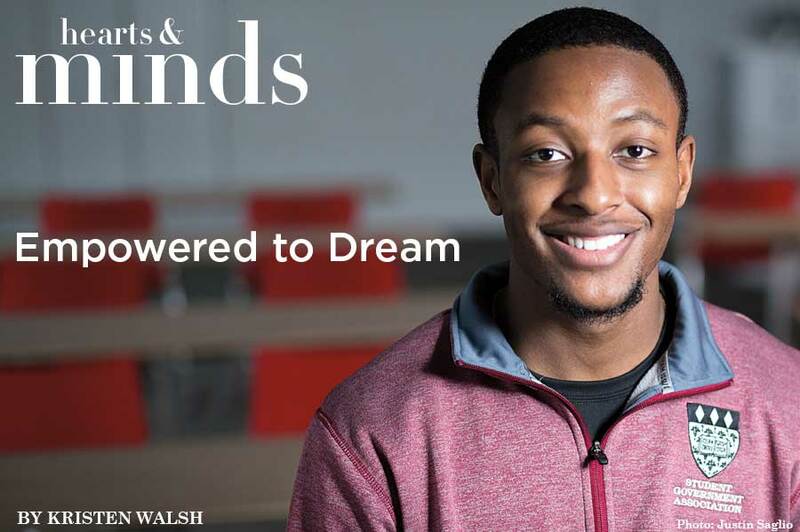 The Regis community is giving Mathieu the tools to do just that, and he is making the most of his opportunities here.